Every year my kids get very nice Easter baskets. They are full of gifts, sweets, and a chocolate bunny. I put the whole basket inside a large cellophane bag and tie their favorite color bow on top. It’s our tradition and I love doing it. Here are some nice Easter gifts for kids. I was so surprised to find this bunny. 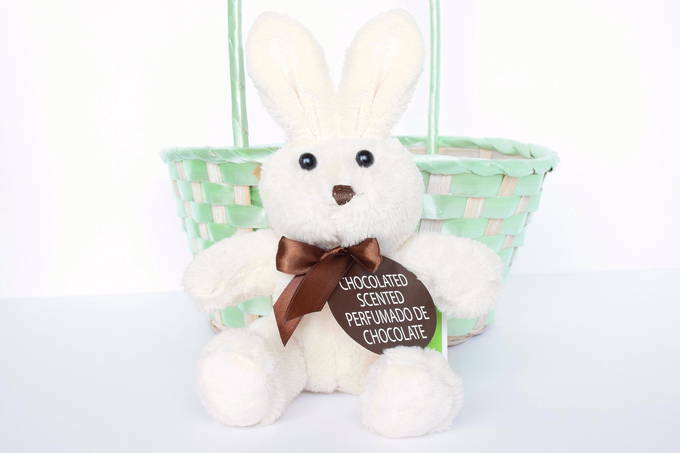 He is scented and smells like CHOCOLATE. What a fun new product. 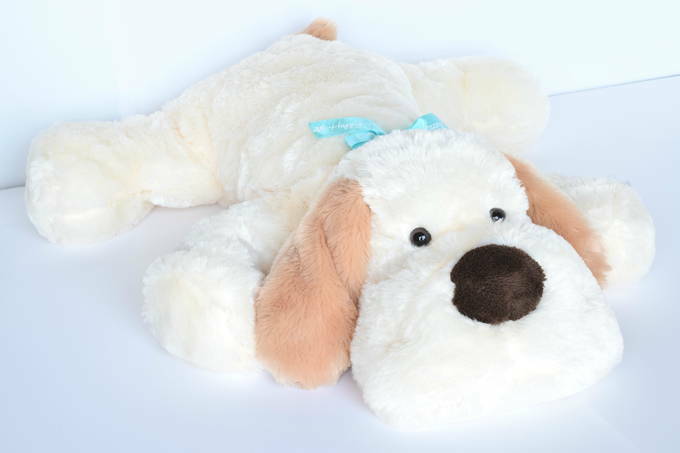 He is 9” tall and comes in cream or brown fur. This jumbo-sized dog immediately stole my heart. He is squeezable and has incredibly soft fur made of a quality plush. His satin bow says “Happy Easter”. And he is huge at 2 feet long. This nicely made basket is so pretty!! 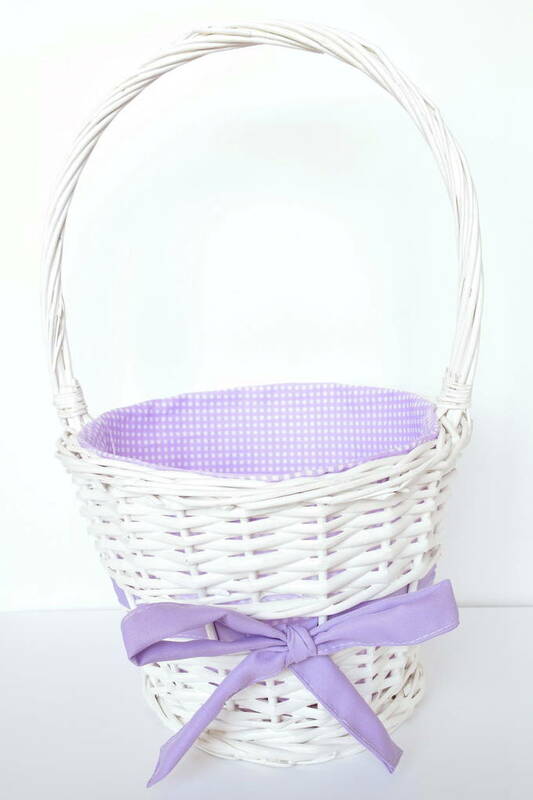 I like how the bow ribbon is woven through the basket. I love the purple. But it also comes in pink and turquoise. It is a large size – 1 x 1½ feet. They also carry two smaller sizes. 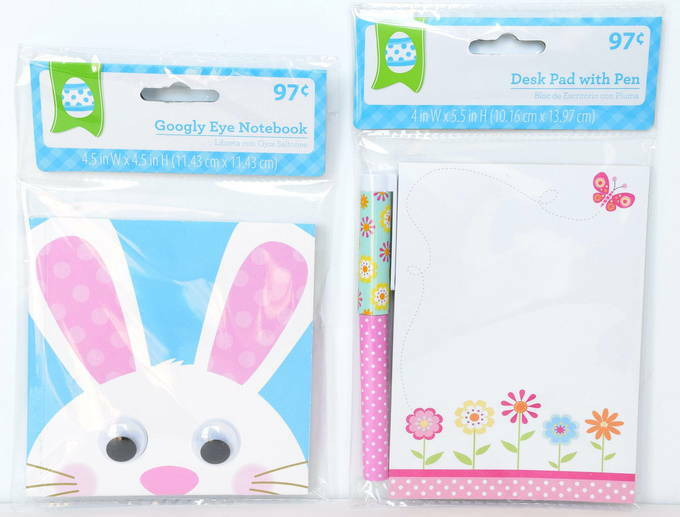 This bunny notebook looks adorable with his googly eyes. It’s 4½” square. My daughter will love the flowery paper pad and the matching pen. It’s 4½ x 5½”. 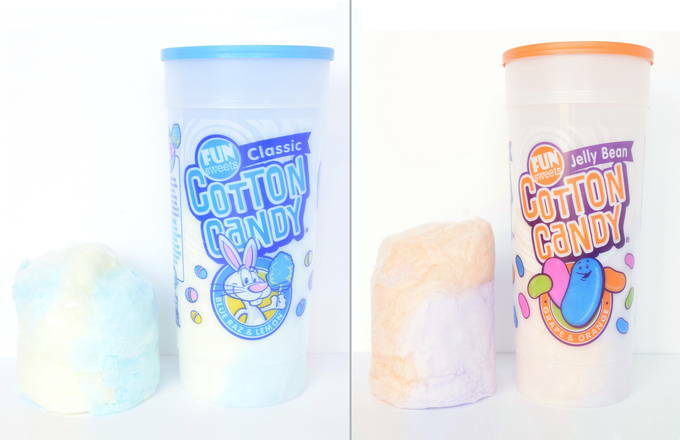 These cotton candy containers have two flavors in them. The Classic container (on the left) is Blue Raz and Lemon. The lemon reminded me of lemon candy drops. The raspberry floss tasted more like blackberry. The lemon and raspberry together was different, but not overpowering. The Jelly Bean tasted just like orange and grape jelly beans. It was quite a surprise at first. If you love orange and grape jellybeans, this is the container for you. I preferred the Classic (Blue Raz and Lemon). The containers are 10” tall. 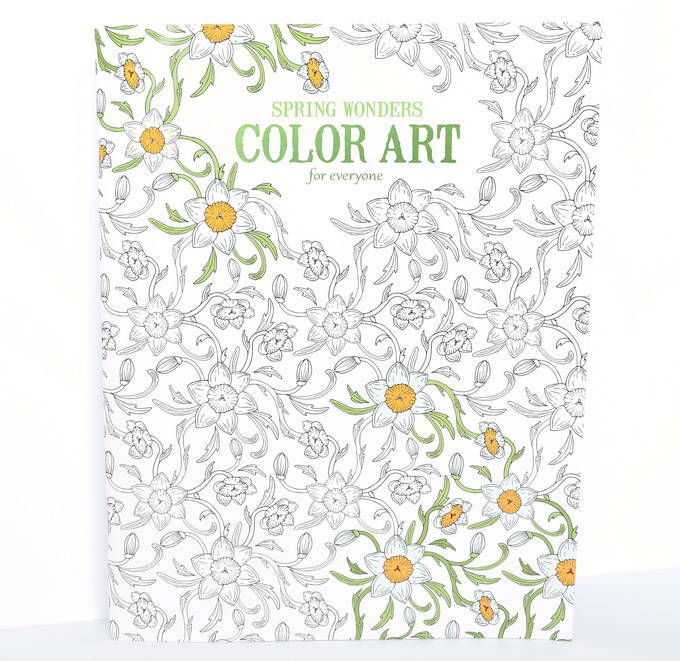 This coloring book has 24 different designs in it. 99% of it is flowers. The pages are perforated so they can be taken out. My oldest daughter really liked this coloring book. It has a variety of pages for you to explore. 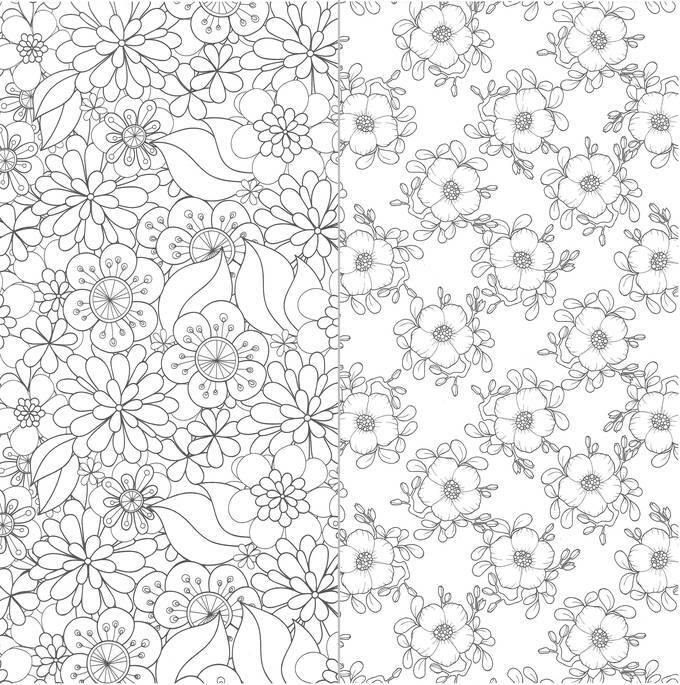 Here are two sample pages (shown side by side). So, the fun part is looking at all the Easter treats and gifts. The hard part is trying to buy these surprises without my kids seeing them.